Hanover, NH – This past weekend, the DRFC hosted the Naval Academy for the opening round of the 2015 Penn Mutual Varsity Cup. With both sides coming off recent matches, Dartmouth against St. Mary’s and Navy against Clemson, the stage was set for a physical and fast paced contest. 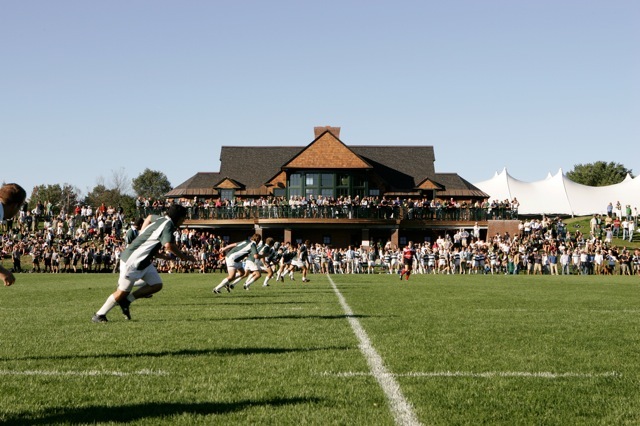 Despite the harsh winter, Brophy field was in fantastic condition and the team was fortunate enough to kit up in the legendary Corey Ford clubhouse and challenge Navy in front of a boisterous home crowd. The match was a physical battle down to the last minute with multiple lead changes and back and forth play. Despite its best ever performance against Navy, the DRFC came up one point shy, falling 23-22 in the final minutes of play. Staunch defensive play by the DRFC led to a tight first half. In the opening minutes, Dartmouth’s defensive wall held strong against repeated pick-n-go’s from the Navy aggressive forward pack and hard crash lines through the midfield. Dartmouth’s defensive effort held a physical Navy side to a try and two penalties in the first 40 minutes of play. Just before half, sustained phase play by the Big Green led to a yellow card penalty advantage deep in Navy territory. With time winding down, Dartmouth kicked for territory, establishing a lineout on the five-meter mark. A beautiful throw from captain Peter Savarese to the back tower set up a maul of wheeling Dartmouth forwards that pounded into the Navy try zone, ending the first half with a burst of Dartmouth momentum and a score of Navy 11, Dartmouth 5. Dartmouth kicked off with the wind to start the second half, which continued to be a battle of back and forth play. Soon after the start of the second half, Dartmouth began to find its attacking rhythm. Off the platform of a mid field scrum, Dartmouth collapsed the Navy defense with a penetrating forward crash line. Second phase, sophomore fly half Dawit Workie dished the ball out wide where a looping connection between fullback Ryan Maguire and center Brendan Cronin left the ball in the hands of John Abraham with space to maneuver. Abraham collected the ball and dashed down the sideline, leaving the Navy fullback scrambling as he touched down under the posts for a 65 meter run. Dartmouth's offense continued to add points in the second half with a strong individual effort by former football captain, Stephen Dazzo, who collected a line drive kick, broke multiple tackles and scored in the corner, and a finishing run by sophomore wing, Max Parker. Coach Gavin Hickie commented on the match and the spring XVs season: “The coaching staff are very proud of the DRFC players who worked very hard to overcome a physical and aggressive Navy team. The effort and desire from Dartmouth was evident, but at times, our decision making let us down. Hickie also commented on the team’s direction for the rest of the spring season, noting that "as we shift our focus to preparation for the CRC, we have a busy few months ahead of us to develop our core skill set and 7s gameplan." "Finally, we would like to thank all our alums for their support throughout our XVs season. We would also like to thank the Dartmouth Facilities Office for working so hard to get Brophy field ready for our game. John Buck and his crew did a fantastic job of getting us back home at Corey Ford Clubhouse for our game against Navy."